C.S. Lewis fans, as well as Focus on the Family Radio Theatre listeners, will be pleased with an upcoming presentation titled C.S. Lewis at War. In the past, we discussed that this audio drama is coming up on the turnpike, and now we have more details on what’s in store. You probably know C.S. “Jack” Lewis as the man who wrote the wryly insightful The Screwtape Letters, the seven children’s stories comprising The Chronicles of Narnia and the masterful defense of Christian belief, Mere Christianity. You may not know that Jack was wounded in World War I. Or that he became a Christian while trying to argue against Christianity. Or that his best-known writings were produced against a backdrop of family difficulties, conflicts with his fellow academics and a world war that impacted every aspect of his life and writing. Now, for the first time, the dramatic story of the life of C.S. 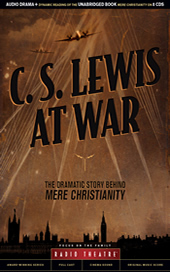 Lewis and the events behind the creation of Mere Christianity and The Screwtape Letters are played out with a full cast of award-winning actors and an original music score — recorded in London, England, and on location in C.S. Lewis’ Oxford home. Also included in this package is a new, dramatic reading of Lewis’ Mere Christianity — capturing the clarity, intelligence and wit of Lewis’ words in a way not experienced before. Forged against the hard realities of war and personal difficulty, Mere Christianity was created to speak to a generation that had lost its faith. Time has not diminished its power. Years later, it still articulates Christian truth with fresh relevancy — and the drama behind the book makes it truly come alive. Visit RadioTheatre.org for more information on this upcoming audio drama from Focus on the Family. Plus, you’ll be able to hear an audio sample of the dramatic reading of Mere Christianity included in the collection. Also, writer Paul McCusker‘s upcoming book―C.S. Lewis and Mere Christianity: The Crisis That Created a Classic―will be available around the same time to complement the audio dramatization.